This morning the Acting President of the Bahrain Centre for Human Rights (BCHR) and Co-Director of the Gulf Center for Human Rights (GCHR) Maryam Al-Khawaja, was informed by a British Airways flight staff member that the Bahrain Government had issued a ban on her name which effectively prevents her from boarding her flight to Bahrain. Ms. Al-Khawaja had decided to visit Bahrain to monitor the situation ahead of planned protests set to take place on 14 August 2013. The Bahraini government has escalated its crackdown on human rights defenders and activists arresting a blogger, a photographer as well as a blogger and his lawyer,  in the past week alone. It also continues to deny entry to journalists, most recently an Aljazeera reporter. Ms. Al-Khawaja thought it pertinent to have monitors on the ground given that the most prominent human right defenders are currently behind bars and the crackdown is intensifying. 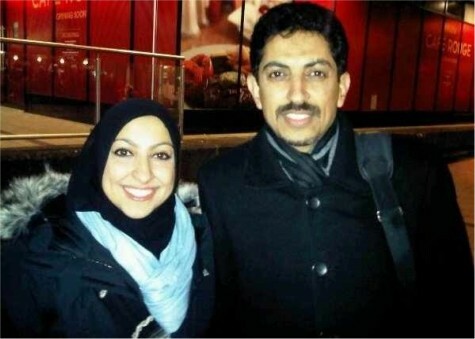 Ms. Al-Khawaja was also hoping to visit her detained father, human rights defender Abdulhadi Al-Khawaja in jail next week where he is due a visit and currently serving a life sentence for his peaceful human rights activism. She was also to visit her sister, human rights activist Zainab Al-Khawaja also serving multiple sentences in the Isa Town Female Detention Centre. The BCHR and the GCHR find this most recent act by the Bahraini Government very worrying as it is clear that it wants no witnesses to its current and anticipated future violations. Banning journalists as well as human rights defenders entry into the country signals a possible escalation in the coming days. Ms. Al-Khawajaha decided to pursue this case to find the reasons why British Airways agreed to ban her from boarding their flight. "21. In no case may a person be arbitrarily deprived of the right to enter his or her own country. The reference to the concept of arbitrariness in this context is intended to emphasize that it applies to all State action, legislative, administrative and judicial; it guarantees that even interference provided for by law should be in accordance with the provisions, aims and objectives of the Covenant and should be, in any event, reasonable in the particular circumstances. The Committee considers that there are few, if any, circumstances in which deprivation of the right to enter one's own country could be reasonable. A State party must not, by stripping a person of nationality or by expelling an individual to a third country, arbitrarily prevent this person from returning to his or her own country."